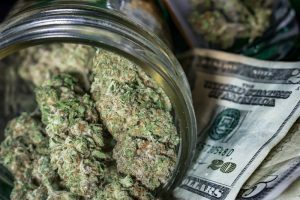 Pot stock profits have gone up in smoke over the past week. Here’s why. To lean on an age-old stock market adage, this could be as simple as “buy the rumor, sell the news.” Although we try and avoid the white noise surrounding short-term events and emotions, not all investors march to the beat of the same drum. In other words, day traders and short-term traders bought into the euphoria of legalization then headed for the exit once the actual event occurred. This could certainly explain the downside volatility witnessed over the past few days in pot stocks. Next, it’s pretty hard for fundamentally focused investors to ignore the valuations of most marijuana stocks. Take medical cannabis grower Tilray (NASDAQ:TLRY) as a good example. Having debuted at $17 per share in July, shares hit $300 on an intraday basis in September and were at $158.38 the day prior to legalization in Canada. At this share price, Tilray supported a valuation in excess of $12 billion, yet it didn’t have $40 million in extrapolated annual sales. Further, it’s well behind its other large peers in terms of peak production potential. Tilray, like most pot stocks, has a long way to go before it can justify its valuation. There’s also genuine concern about the supply of dried flower. Although there’s little precedent for recreational legalization around the world, Colorado, Washington, and Oregon in the U.S. provide a worrisome example of what could happen in Canada. In these adult-use-legal states, growers produced cannabis without any mind to actual demand, thereby oversupplying the market and driving down the per-gram price for weed. It’s a recipe for weaker margins for growers, even with economies of scale working in their favor, and it could be what’s in store for Canadian growers in the not-so-distant future. Fourth, and building on the previous point, many high-margin products aren’t legal right now. Growers like Aphria (NASDAQOTH:APHQF) are eager to tap into high-margin alternative cannabis products, such as concentrates. Aphria is currently constructing an extraction facility that’ll be used to produce 25,000 kilogram-equivalents of cannabis concentrate annually once completed. But the thing is, it’s unclear when Parliament will OK the use of consumption options like concentrates, infused beverages, vapes, and edibles. That puts Aphria and its peers in limbo, and it makes them reliant on lower-margin dried flower for the time being. Wall Street and investors might also be waking up to the fact that the black market isn’t going anywhere. Despite Canada setting a low excise tax of roughly 10% of recreational weed sales, the illicit market won’t be paying this tax or federal income tax to the Canadian government. The black market also skirts license and cultivation fees and wait times. In short, it can consistently undercut legal channels on price, which will likely cut into peak sales projections for Canada. Investors may also have a bit of history on their minds. That’s because the bubble has burst with each and every “next big thing” investment over the last quarter century. Whether we’re talking about the advent of the internet, business-to-business commerce, genomics, 3D printing, blockchain technology, or any other game changer, the bubble eventually burst. While there will undoubtedly be cannabis winners, it’ll take time for these businesses to mature and for weaker players to step aside. Wall Street and investors might be realizing that. Now that Canada has officially legalized recreational pot, investors want to see tangible results. To this point, they’ve been promised huge peak production figures and triple-digit annual sales growth with profits. The question is: Can marijuana stocks deliver? Without much in the way of tangible data to sift through as of yet, some investors might be heading for the sidelines. Needless to say, the next round of earnings reports for marijuana stocks could create a lot of volatility. Don’t overlook the role that share-based dilution might be playing with cannabis stocks. For example, Aurora Cannabis (NYSE:ACB) has been aggressively growing via acquisition, partnership, and organic projects. Since the year began, its peak production has grown from a little north of 100,000 kilograms to at least 570,000 kilograms when at full capacity (and not counting its ICC Labs acquisition). But in order to make this happen, Aurora Cannabis has undertaken numerous bought-deal offerings to raise capital, which, in turn, could push its outstanding share count to around 1 billion. The more shares Aurora Cannabis has outstanding, the less likely it is to turn a meaningful per-share profit. Deal-making news has also slowed down in recent weeks. Following the August announcements that Molson Coors Brewing Co. and HEXO Corp. were forming a joint venture to create cannabis-infused beverages and Constellation Brands was taking an additional $3.8 billion stake in Canopy Growth Corp., not much has happened in terms of partnerships and investments with brand-name companies. Investors are counting on marijuana stocks to forge brand-name beverage, tobacco, and/or pharmaceutical deals, but they’ve seemed to dry up over the past two months. Last, it’s possible investors are concerned that the U.S. won’t continue to move toward some form of legalization or easing of restrictions on cannabis. If the U.S. legalized cannabis, it would easily be the largest marijuana market in the world — and investors know this. With 30 states having passed some form of medical marijuana legislation, the expectation is that the U.S. could soon revisit and alter its federal stance on pot. Of course, the upcoming midterm elections could have a lot of bearing on whether that happens. If Congress or President Trump chooses to ignore the momentum of the U.S. cannabis movement, it’d be yet another reason for pot stocks to deflate.